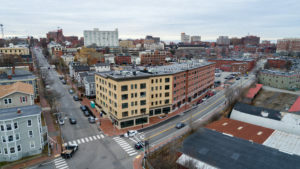 J.B. Brown & Sons has been developing large commercial buildings dating back to 1868 when John Bundy Brown built the six-story, 240 guest room, Falmouth Hotel on Middle Street. The building served as a symbol of Portland’s post-fire commercial district rebirth. Today, our experienced and responsive management team continues our tradition of stable growth through commercial development and is actively pursuing development and ownership opportunities.